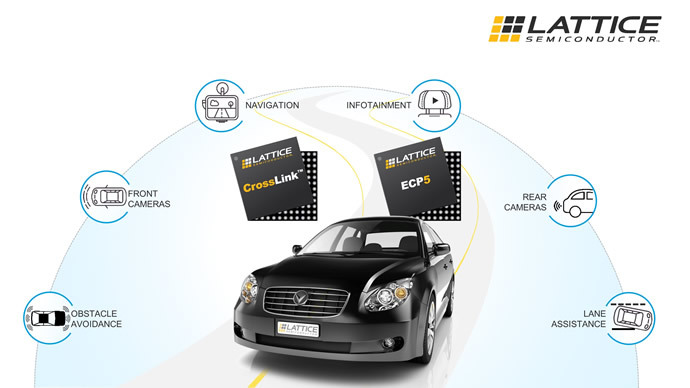 The automotive product portfolio from Lattice Semiconductor Corporation has been expanded with the introduction of the ECP5 and CrossLink programmable devices tailored specifically for interface bridging applications. The two products deliver optimised connectivity solutions for Advanced Driver Assistance Systems (ADAS) and infotainment applications, while also bridging the gap between emerging image sensor and video display interfaces with legacy automotive interfaces. Dramatic advances in mobile application processors, the rapid proliferation of low cost image sensors and displays, and the widespread adoption of MIPI standard interfaces has accelerated innovation in automotive applications over the past few years. Ideally each device in a system would interface directly to the applications processor, but this is not always the case. This problem is compounded still further as the use of mobile platforms in automotive applications increases. Interface bridging devices solve this problem by supporting a wide range of interfaces and protocols including MIPI D-PHY, MIPI CSI-2, MIPI DSI as well as a long list of legacy video interfaces and protocols such as CMOS, RGB, MIPI DPI, MIPI DBI, SubLVDS, SLVS, LVDS and OpenLDI. Cost optimised architecture with high speed SERDES channels to provide video interfaces to Open LDI, LVDS FPD-Link, eDP, PCIe and GigE. Software support in Lattice Diamond 3.8. Industry’s smallest package size with a 6mm2 option.